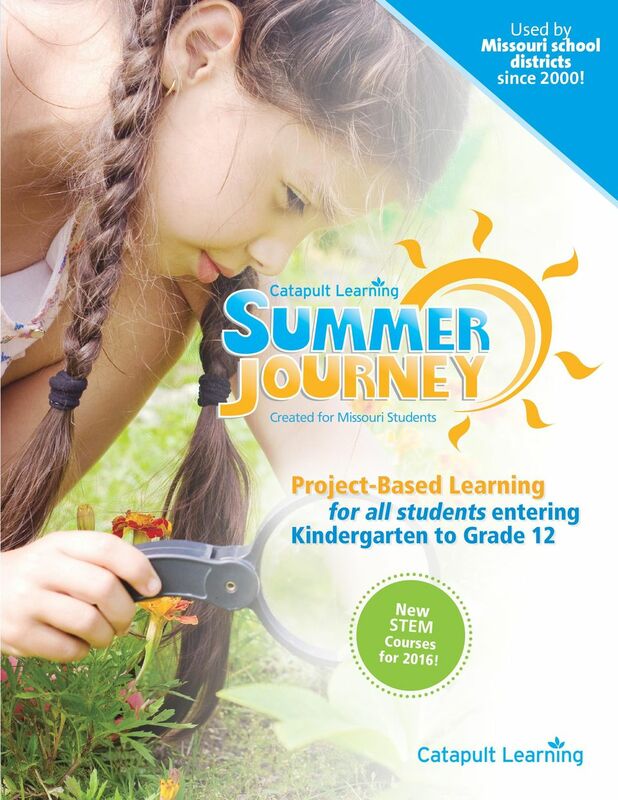 Download "Project-Based Learning for all students entering Kindergarten to Grade 12. Used by Missouri school districts since 2000! New STEM. Courses for 2016!" 1 Used by Missouri school districts since 2000! 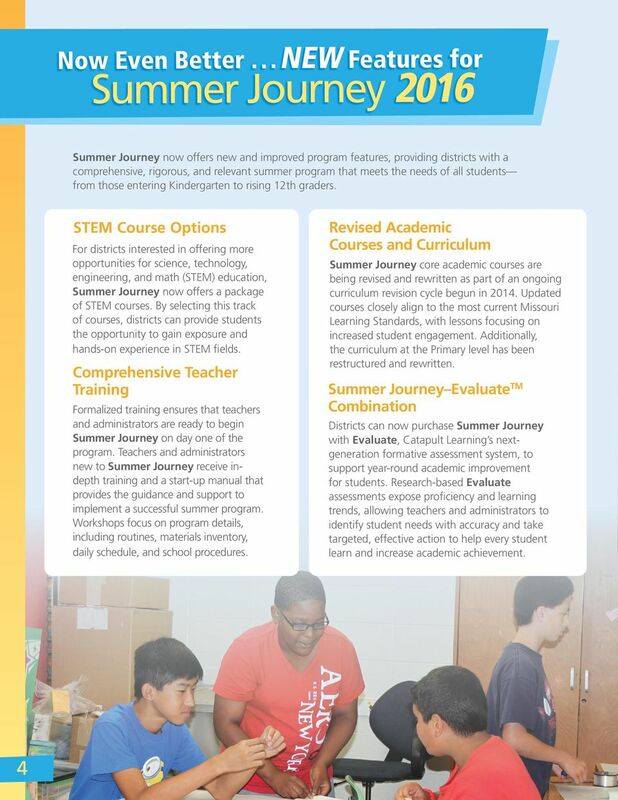 Created for Missouri Students Project-Based Learning for all students entering Kindergarten to Grade 12 New STEM Courses for 2016! 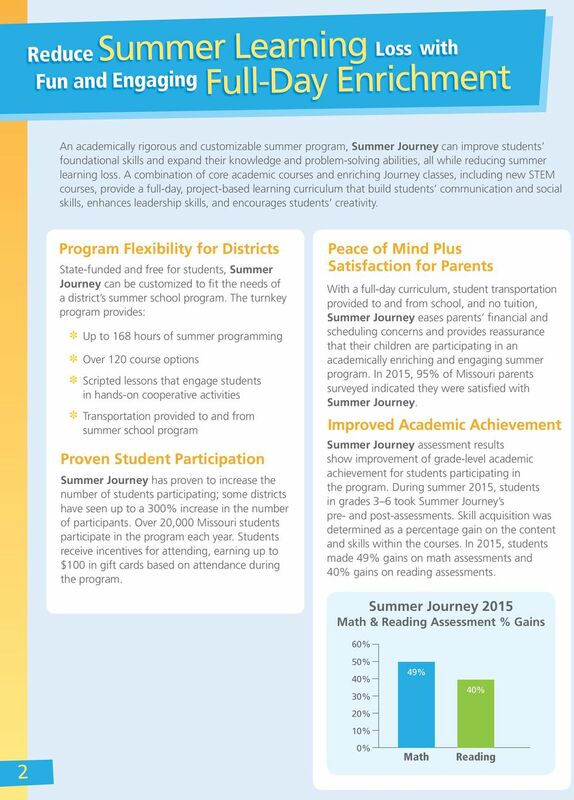 4 Now Even Better... NEW Features for Summer Journey 2016 Summer Journey now offers new and improved program features, providing districts with a comprehensive, rigorous, and relevant summer program that meets the needs of all students from those entering Kindergarten to rising 12th graders. 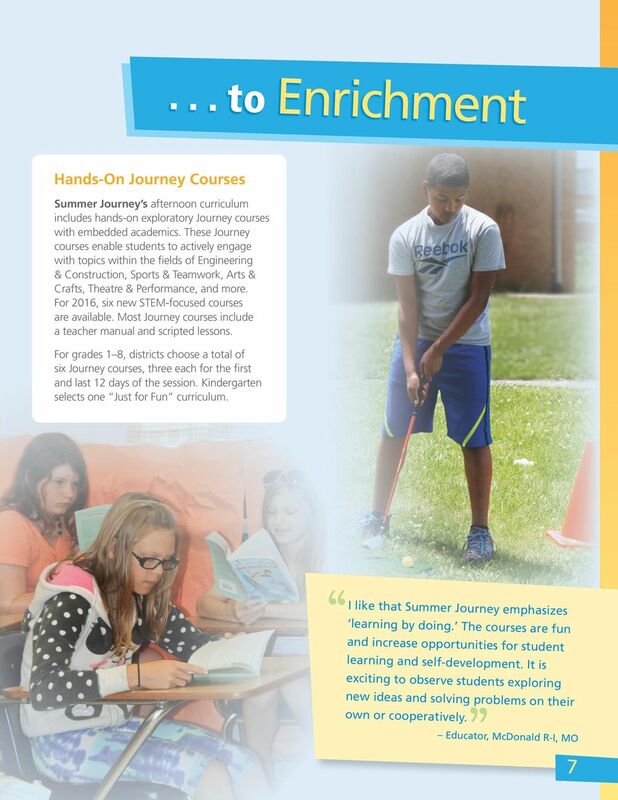 STEM Course Options For districts interested in offering more opportunities for science, technology, engineering, and math (STEM) education, Summer Journey now offers a package of STEM courses. By selecting this track of courses, districts can provide students the opportunity to gain exposure and hands-on experience in STEM fields. Comprehensive Teacher Training Formalized training ensures that teachers and administrators are ready to begin Summer Journey on day one of the program. 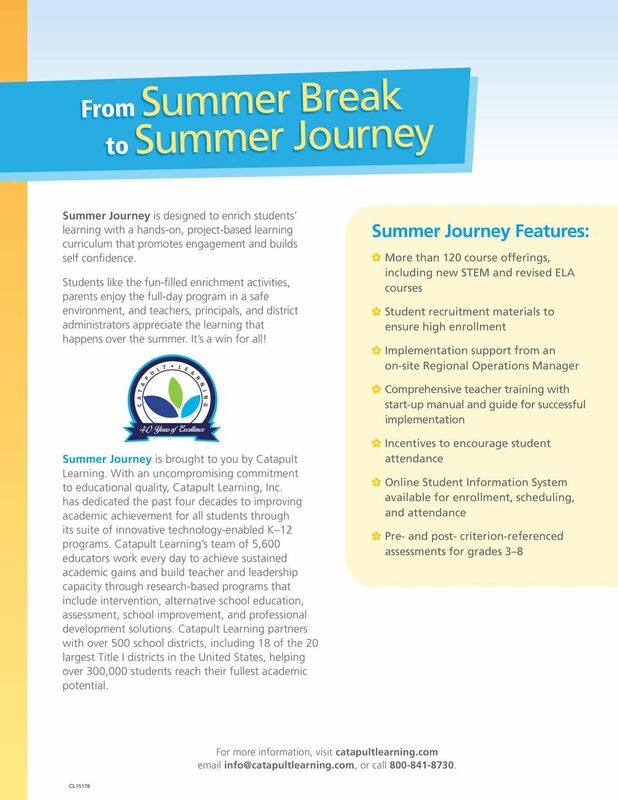 Teachers and administrators new to Summer Journey receive indepth training and a start-up manual that provides the guidance and support to implement a successful summer program. Workshops focus on program details, including routines, materials inventory, daily schedule, and school procedures. 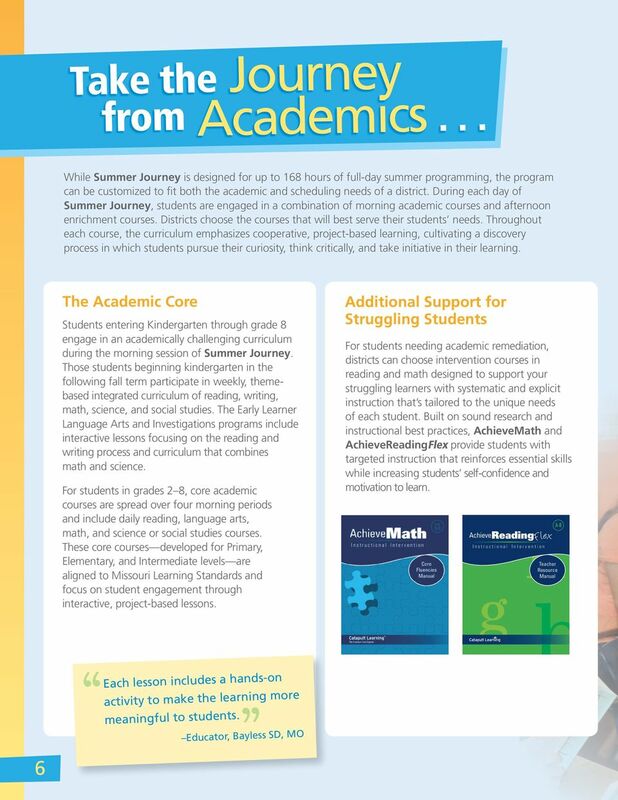 4 Revised Academic Courses and Curriculum Summer Journey core academic courses are being revised and rewritten as part of an ongoing curriculum revision cycle begun in Updated courses closely align to the most current Missouri Learning Standards, with lessons focusing on increased student engagement. Additionally, the curriculum at the Primary level has been restructured and rewritten. 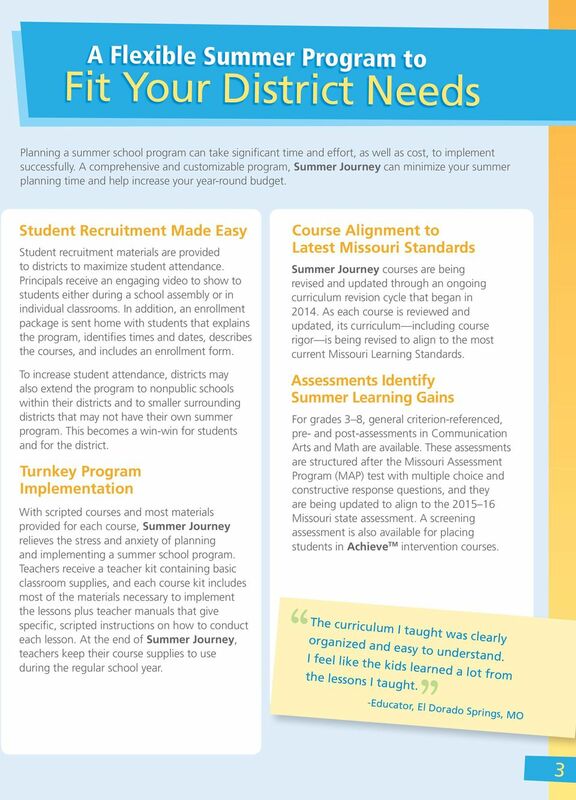 Summer Journey EvaluateTM Combination Districts can now purchase Summer Journey Summer Journey-Evaluate Bundle with Evaluate, Catapult Learning s next- Option generation formative assessment system, to support year-round academic improvement for students. 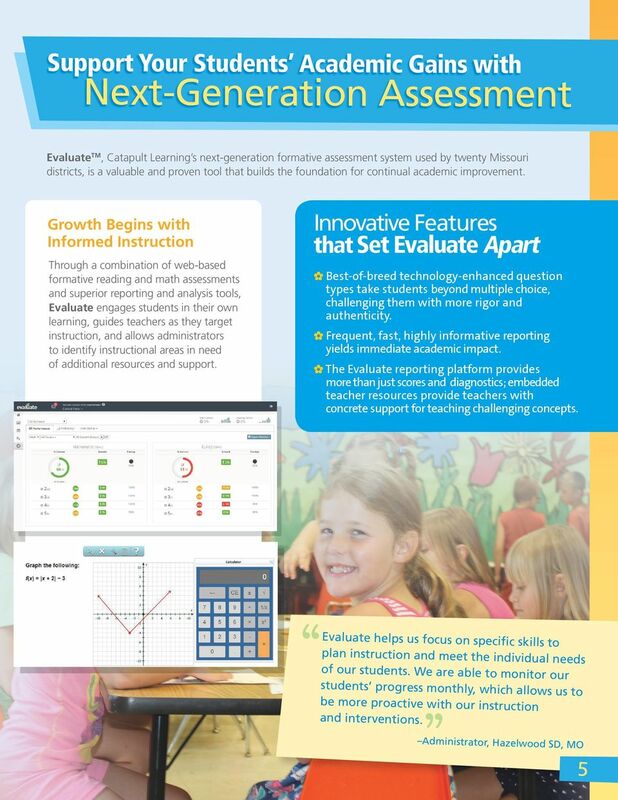 Research-based Evaluate assessments expose proficiency and learning trends, allowing teachers and administrators to identify student needs with accuracy and take targeted, effective action to help every student learn and increase academic achievement. Note: This is a sample report designed to provide team chairs with a quick review of the components of the web-based report. The formatting of the report is done automatically through the web-based system. Program Overview. This guide explains the program components and philosophy of the research-based program, Math Navigator, Common Core Edition. A partner school of K 12, the leader in K 12 online education Welcome Dear Minnesota families, VIBE Academy is a public school using an innovative model to provide your child with the best education possible. 2016 PARTNER BENEFITS February 2-4, 2016 South Towne Expo Center Research has proven that one of the best ways to engage students in science, technology, engineering and math is with hands-on activities. Moberly School District. Moberly School District. Annual District Report 2009-2010. Accredited with Distinction. www.moberly.k12.mo. Middle Grades Action Kit How To Use the Survey Tools! academic tutors, offering them access to tutor certification and numerous opportunities to master new techniques and methods. Instructional Framework What Do We Mean By Strong Instructional Programs and Supportive School Communities? STEM CURRICULUM AND SOLUTIONS Courses, Resources, and Support to Prepare Your Students for Their Future Helping schools and districts strengthen STEM education Without a doubt, it s a national priority. Please read this carefully prior to submitting your application. Targeted Reading Intervention for Students in Grades K-6 Reading results. Imagine the possibilities. OVERCOMING OBSTACLES: HELPING EDUCATORS KEEP STUDENTS ENGAGED 1 Workshop Objectives: Participants will discuss the issue of student disengagement and share best practices for keeping students engaged.